Two days before the High Court case looking at the legality of maintaining offshore detention facilities, Nauru dramatically announced that detention will end on the island. From Monday 5 October, detained asylum seekers are supposedly able to freely roam Nauru, 24/7. But wait, there’s more. Around 600 asylum seekers, who have been waiting for refugee decisions for almost two years, will get their determinations within a week. Sound good? The only thing missing is the steak knives. Although the Nauru government denies it, the announcement is clearly driven by concerns about the Australian High Court case, which will consider whether detaining people offshore is unlawful. So, they are declared “un-detained”. The reality is the announcement means little for those incarcerated on Nauru. People may be found to be refugees but there is nowhere in the community for them to live. Nothing is prepared. So, they will physically remain in the same intolerably stifling tents because the accommodation blocks being built inside the detention centre are unfinished. Freedom to roam Nauru is not freedom at all, when there is no security in the community, and no future. The island itself is a prison. Refugees cannot leave Nauru; they cannot travel; they cannot bring their families and they have only a temporary residence visa that now may last ten years. But ten years without a job, and children and teenagers deprived of an education, is a lifelong loss. There are no jobs; no prospects for education. 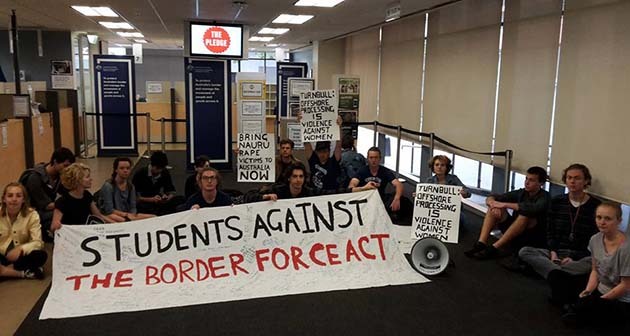 The unaccompanied minors released from detention in October last year are not allowed to enrol in Nauruan schools. Single refugees are expected to survive on an allowance of just $100 a week; $180 for a couple. But this doesn’t cover the basic cost of living on Nauru. Eggs are $1 each; rice is $18 for 4 kilos; drinking water has to be bought and costs $12 for 19 litres. Some conditions out of detention are a lot worse than in detention. The medical facilities at the Republic of Nauru hospital, for example, are much worse than those available inside the detention centre. Only four months ago, the Australian government was forced to send an expert orthopaedic surgical team to Nauru to save a boy’s arm, because setting the 11-year-old’s broken arm had been botched at the hospital. And that wasn’t the first time. Until now, asylum seeker women were being brought to Australia to give birth. But as refugees, women will be forced to give birth in Port Moresby or on Nauru itself. On Nauru, infant mortality in 2012 was 30 deaths per 1000 live births, compared with 4.43 per 1000 live births in Australia (2014). The combined efforts of the Australian and Nauruan governments have resulted in refugees being actively discriminated against and systematically deprived of their rights. Facebook is blocked; assemblies and protests are effectively banned. The medical facilities are sub-standard, and many refugees suffer debilitating, untreated health problems. Only three days before the open centre announcement, two 18-year-olds were ambushed, bashed and robbed by a gang of up to 12 local Nauruans. This wasn’t the first time. In October and November 2014, there were nine assaults on under-age refugees. The house where they live was broken into six times in less than 12 months; the last time as recently as August. But it is the unbelievable war on refugee women on Nauru that particularly shames and damns offshore processing and the Australian government. Single refugee women living in the relatively remote refugee camps dotted around the island have been left isolated, vulnerable and subject to repeated break-ins, harassment and sexual assaults. The brutal rapes of refugee women on Nauru reveal the systemic abuse and sexual assault of women living outside the detention centre. The shocking ABC 7.30 story highlighted just two rapes of Somali women. There are many more. Women freed to live in the community are now the victims of a reign of terror supported by the policies of the Australian and Nauruan governments. There were serious illusions that new Prime Minister Malcolm Turnbull would at least modify offshore processing—but the gloss is quickly wearing off. The day he appointed a few more female Cabinet Ministers, he declared that he wanted Australia to be known for respecting women. A few days later, it was a different story. The reports of rapes of refugee women on Nauru were alarming, but, he added, “these tough, harsh policies of offshore processing actually work”. Similarly, Turnbull turned a deaf ear to the requests for a termination from a 23-year-old Somali woman who became pregnant after being raped in August. Nauru is not even a gilded cage—it is a house of horrors. Both Manus and Nauru must be closed.